With the UK experiencing rising rates of family breakdown, readily available access to support for struggling families or those in crisis is more important than ever. In many circumstances, having a member of the family with a learning disability or special educational needs can place an enormous additional strain on families. While issues range from physical, sexual and/or emotional abuse, domestic violence, depression, mental health issues, family breakdown, bereavement, social isolation, suicidal thoughts, addiction and poverty, many families in crisis are unable or reluctant to access local authority services. Synagogues offer a safe and welcoming space for those in the community to seek support or guidance. 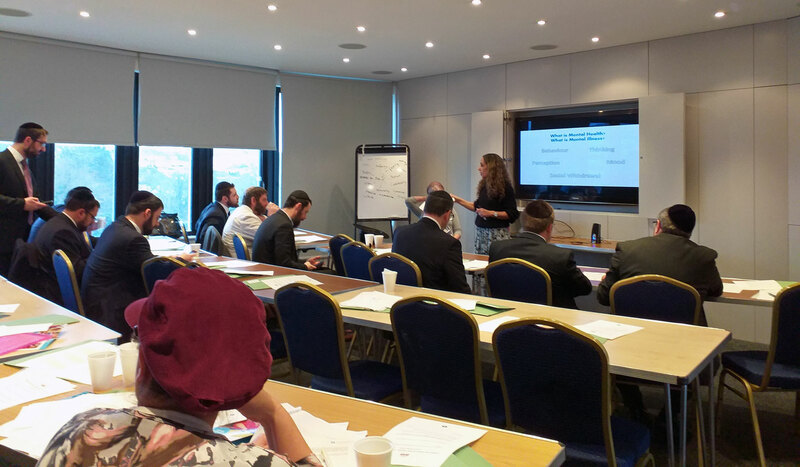 P’eir – the rabbinic training and support arm of the United Synagogue – arranges professional development seminars for rabbis and rebbetzens. Witnessing firsthand this rising need for support prompted Rabbi Dr Julian Shindler, P’eir’s programmes director, to contact Norwood to ask if their professionals might provide training to better equip United Synagogue rabbis and rebbetzens with the tools to support vulnerable families and arm them with information on where to direct families who need additional support. On Wednesday 23 January, P’eir partnered with Norwood to deliver training at Finchley United Synagogue to around 25-30 rabbis and rebbetzens from United Synagogues across North-West London. The training, “Children and Families – Moving Forward”, looked at the impact of family breakdown, mental health and special educational needs on a child, the parents and siblings, and on the wider community. There was a specific focus on understanding the struggles that people have in these areas, how they impact on their day to day living and experiences with others. There was also guidance on how rabbis and rebbetzens can be supportive and inclusive of individuals and families who often feel left isolated in the community. The session also shared information on how Norwood’s Children and Families Service provides a whole range of universal, targeted and specialist services to the Jewish and wider community in London. To access advice, social work services, support groups or counselling for children and families, you can contact Norwood on 020 8809 8809 or at norwood.org.uk.